Aframomum corrorima is a species in the ginger family, Zingiberaceae. 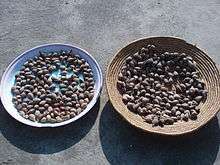 The spice, known as korarima, Ethiopian cardamom, or false cardamom, is obtained from the plant's seeds (usually dried), and is extensively used in Ethiopian and Eritrean cuisine. It is an ingredient in berbere, mitmita, awaze, and other spice mixtures, and is also used to flavor coffee. In Ethiopian herbal medicine, the seeds are used as a tonic, carminative, and laxative. ↑ Amomum corrorima A.Braun, the basionym of Aframomum corrorima (A.Braun) P.C.M.Jansen, was originally described and published in Flora 31:95. 1848 GRIN. "Amomum corrorima information from NPGS/GRIN". Taxonomy for Plants. National Germplasm Resources Laboratory, Beltsville, Maryland: USDA, ARS, National Genetic Resources Program. Retrieved June 19, 2011. ↑ Bernard Roussel and François Verdeaux (April 6–10, 2003). "Natural patrimony and local communities in ethiopia: geographical advantages and limitations of a system of indications" (PDF). 29th Annual Spring Symposium of Centre for African Studies. Archived from the original (PDF) on 2006-11-26. This Zingiberaceae, Aframomum corrorima (Braun) Jansen, is gathered in forests, and also grown in gardens. It is a basic spice in Ethiopia, used to flavor coffee and as an ingredient in various widely used condiments (berbere, mitmita, awaze, among others). ↑ Jansen, P.C.M. (2002). "Aframomum corrorima (Braun)". Archived from the original on 2008-11-20. P.C.M. Jansen. Record from Protabase. Oyen, L.P.A. & Lemmens, R.H.M.J. (Editors). PROTA (Plant Resources of Tropical Africa / Ressources végétales de l’Afrique tropicale), Wageningen, the Netherlands. Wikimedia Commons has media related to Aframomum corrorima.